Garlic, which is related to onions and leeks, contains powerful phytochemicals and nutrients that help fight off disease. Research shows garlic's potential benefits against ailments such as heart disease and cancer. Roasting is one common method of preparation for garlic that imparts a sweet taste to this otherwise pungent food. One clove of garlic, weighing about 3 g, contains about 3 percent of the daily recommendation for manganese. Manganese is incorporated into enzymes and also acts as the primary antioxidant in the mitochondria of cells. Garlic also contains vitamin C, another antioxidant nutrient that also helps build the structural tissue of blood vessels, ligaments, tendons and bone. The trace element selenium, also found in garlic, functions in the activity of a variety of different enzymes. Garlic may also make the body better able to utilize iron and zinc when consumed with foods containing these minerals, explains a 2010 article in the "Journal of Agricultural Food Chemistry." Garlic contains sulfur compounds that are responsible for its distinctive odor and may also provide health benefits. The sulfur compounds in garlic act as antioxidants and also promote the formation of another antioxidant called glutathione, which is produced by the body. 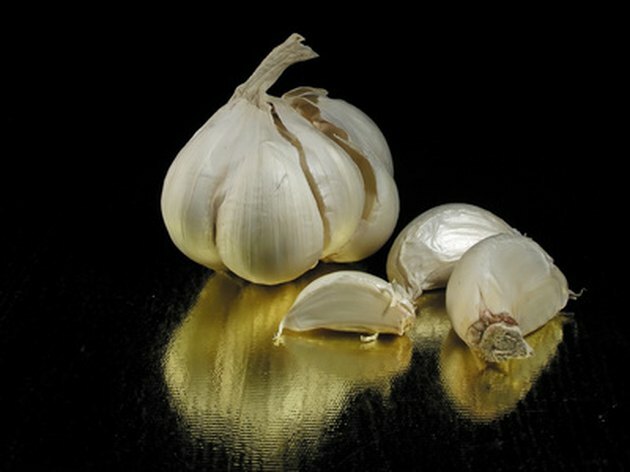 Another function of the sulfur compounds in garlic is antimicrobial activity. Garlic can kill bacteria, viruses and fungi, including H. pylori, the bacteria linked to stomach ulcers. In addition to the sulfur compounds, garlic also contains flavonoids, including quercetin, luteolin and kaempferol, which function as antioxidants. Lightly crushing the side of garlic and letting it stand for 10 minutes before roasting it at 400 degrees Fahrenheit for 30 to 40 minutes can help release more of the beneficial sulfur compounds. The act of crushing garlic causes an enzymatic reaction that produces the compound allicin. Since cooking garlic can destroy some of the healthy sulfurous compounds, crushing it beforehand is a method of retaining many of the health benefits. Roasted garlic may help prevent cardiovascular disease, although more research is needed because few human studies have been completed. According to the Linus Pauling Institute, garlic may affect cholesterol production by inhibiting the synthesis of cholesterol by the liver. Garlic also has anti-inflammatory properties and reduces blood clotting. Consumption of roasted garlic may offer some protection against cancer. Aside from the antioxidants present in garlic, the sulfur compounds it contains also act directly on carcinogens and toxins, helping the body remove them before they can cause damage. In addition, these compounds induce cancer-cell self-destruction, a process called apoptosis, in cell culture experiments and animal models, explains the Linus Pauling Institute.